How would you feel about a robot co-worker? Apparently the British public isn't totally against it - as long as AI isn't in charge of anything dangerous. Nobody panic but Google’s AI has beaten a top Go player twice in a row, a milestone in artificial intelligence that wasn’t expected for years. With such rapid developments, it’s not surprising people are getting a bit edgy about the rise of robotics. But some people are also considering its potential. YouGov conducted a survey of 2,000 people on the behalf of the British Science Association (BSA) and found 60% of people think the use of robots or programmes equipped with AI will lead to fewer jobs within ten years. They're not the most pessimistic - 36% think the development of AI poses a threat to the long-term survival of humanity. The younger demographic, though, might be more open to AI in the workplace. Nearly a third of 18-24 year-olds surveyed could see robots as future co-workers. So just how would integration of robots alongside human staff pan out? The BSA’s study found significant resistance to robots equipped with ‘emotions’ or a ‘personality’, while around half of the public wouldn’t trust robots in roles where lives could be in danger. So that's a no on surgical procedures, driving public buses, or flying aeroplanes. To have a robot as a co-worker, so to speak, there’d likely need a level of respect established. So not how you treat your mercurial laptop - you can't turn your finance director off and on again when they don't listen, after all. Suspicion of new developments isn’t insurmountable, but it can be a sticking point. It hasn’t held tech back when it comes to people using self-service checkouts for example, but it may well do on something people associate with more skill and risk attached to it. Some convincing will need to be done to show AI is up to the task – and probably some bedding in of any new developments to allow people to get used to them. From a business perspective we are seeing a whole lot more in the realms of automation, particularly across sectors such as manufacturing. The World Economic Forum has predicted more than five million jobs will be lost globally by 2020 due to such developments. The rate of change is part of what’s causing people to feel so unsettled. 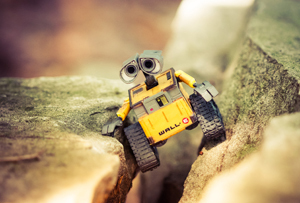 So, you won't be greeting Wall-E as your co-worker just yet, but don't rule it out in the future.